VIP Boat Packages: For those who may be unsure about operating their own vessel or just want to enjoy a day of Watersports without the hassles of operating the boat, this may be the package for you. Available for half day rentals or full day. All the toys included along with instructor, driver. 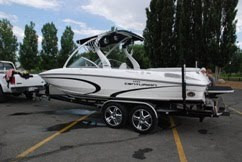 VIP boat rentals are for those who want to spend more time with family and friends instead of the hassles of taking care of the boat or if you are a little unsure of operating a vessel your self than the VIP package is for you. The VIP package includes your own personal instruction in our Centurion Avalanche or Centurion Enzo 23 with surf package with all the Toys included. Available on half day or full day rentals. Take the worry out of you day let us do to the work and the worry of the boat. VIP Package includes: professional driver/instructor wakeboards, water-skis, kneeboards, life vests, pull tubes, water tramp for the kids if needed, certified in wilderness first responder first aid. For full day Rentals we will start as early as you want in the morning and go all day. The day is yours we are there to service you and your group. Great for family reunions, groups of friend and business outings. We cover all Cities in Utah including Provo, Richfield, Riverton, Roosevelt, Roy, Salina, Salt Lake City, Sandy, Santaquin, Smithfield, South Jordan, South Ogden, South Salt Lake, Spanish Fork, Springville, Saint George, Sunset, Taylorsville, Thompson, Tooele, Torrey, Tremonton, Vernal, Vernon, Wallsburg, Washington, Washington Terrace, Wellsville, Wendover, West Haven, West Jordan, West Valley City, Woodruff, and Woods Cross City, American fork, Aneth, Ballard, Beaver, Bingham Canyon, Blanding, Boulder, Bountiful, Brigham City, Cedar City, Centerville, Clarkston, Clearfield, Coalville, Corinne, Cottonwood Heights, Dammeron Valley, Delta, American fork, Aneth, Ballard, Beaver, Bingham Canyon, Blanding, Boulder, Bountiful, Brigham City, Cedar City, Centerville, Clarkston, Clearfield, Coalville, Corinne, Cottonwood Heights, Dammeron Valley, Delta,Deweyville, Draper, Duchesne, East Carbon, East Millcreek, Enterprise, Ephraim Utah, Eureka, Fairview, Farmington, Ferron, Fillmore, Garden City, Grantsville, Green River, Grouse Creek, Gunnison, Hanna, Myton, Naples, Nephi, New Harmony, North Ogden, North Salt lake city, Ogden, Orem, Panguitch, Paradise, Paragonah, Park City, Payson, Pleasant Grove, and Price. All lake in Utah Incuding Lake Powell, Utah Lake, Deer Creek Reservoir, Yuba lake, Jordanelle Reservoir, Sand Hollow Reservoir, Willard Bay, Pine View Reservoir, East Canyon Reservoir, Scofield Reservoir, Starvations Reservoir, Strawberry Reservoir, Flaming Gorge, Echo Reservoir, Electric Lake, Huntington Reservoir, Mantua Reservoir, Mona Reservoir, Navajo lake, Gunlock Reservoir, Hyrum Resorvoir, Millsite Reservoir, Otter Creek, Palisades Reservoir,Quail Creek Reservoir, Red Fleet Reservoir, and Rock Port Reservoir. A really great site and thanks for that. I am reading it a little at a time.